Forex binary options can help minimize one’s exposure to risk when used in conjunction with a long forex position by limiting one’s losses should the currency pair not perform as one is expecting. In order to elucidate the binary options strategy of using a fx option to hedge a long forex position, let’s take a look at a recent example where a binary option could have limited risk exposure on a long position. On Wednesday, July 27th, the US Census Bureau released the Core Durable Good Orders for June which measures the change in the total value of new purchase orders placed with manufacturers for durable goods, excluding transportation items. The reading came out at 0.1% – below the forecast of 0.5% – signaling that orders had increased less than expected perhaps indicating sluggish US economic growth and thus weighing down the US dollar. Normally, one would expect this important economic statistic to push the value of the US dollar down vis-a-vis the euro meaning that it would be advantageous to invest in a long position on EUR/USD in expectation that the euro would climb in value. However, let’s say that you are looking for a way to hedge your long forex position on EUR/USD so that even if the pair does not perform as you’re expecting it to, you will not lose money. One way of doing so is investing in a PUT on an EUR/USD forex binary option that expires 30 minutes after the opening of your long forex position. 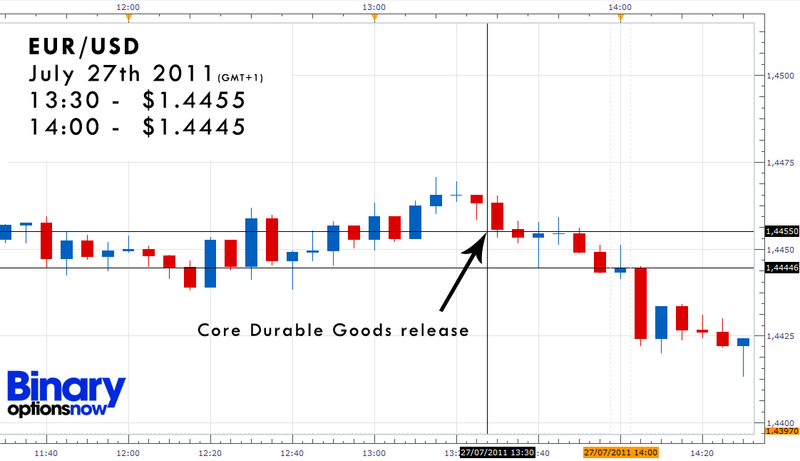 Here is the 5 minute EUR/USD forex chart immediately following the release of the Core Durable Goods Orders report at 13:30 (GMT +1) on July 27th. Let’s say that you went long on EUR/USD investing in one trading lot of $100,000 when the currency pair was trading at 1.4455 at 13:30 (GMT +1) with the expectation that the currency pair would climb in value at least 25 pips. At the same time, you invested $200 in a PUT on an EUR/USD binary option with a 30 minute expiry (14:00) that pays out 85% in order to hedge your long forex position in case the currency pair declines in value contrary to your expectations. At 14:00, you close your long forex position because you have suffered a loss since EUR/USD has begun declining in value – as you can see on the chart – but you are rewarded with a $170 payout from your EUR/USD binary option which expires in-the-money. Now, let’s examine what would have happened if the scenario would have been reversed. That is to say, what if EUR/USD had in fact climbed in value by at least 25 pips as you had predicted in which case your binary option investment would have finished out-of-the-money? As you can see, investing in a put on a forex binary option can help minimize one’s losses by hedging a long forex position on the same currency pair in case the pair does not perform as anticipated. Remember, the financial markets are constantly being influenced by myriad factors so there is no guarantee that this strategy will always work in your favor. However, when used appropriately, binary options may limit a trader’s exposure to risk in the forex markets.